I'm usually so much more prepared for holidays when they turn the corner. 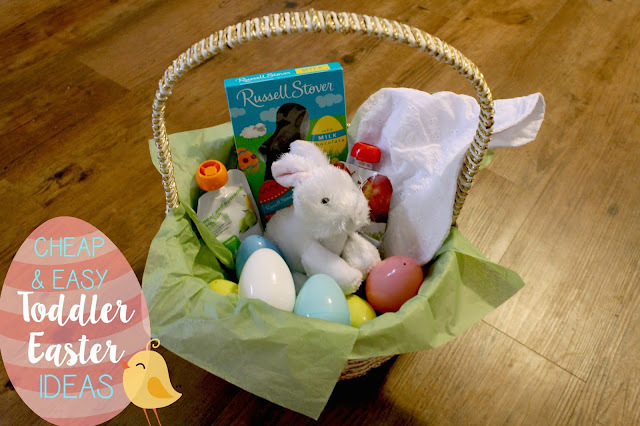 I have gifts and cards stocked up and held back for months before the holiday even arrives, but this Easter I found myself scrambling at the last minute to hit the stores for Lucy's basket gifts. Last year Lucy was only 3 months old at Easter, so her basket wasn't filled with much besides some small rattles and a couple of board books. This year, at 14 months old, she can enjoy a few more things and will probably be a lot more excited about diving into her basket...not to mention enjoying some yummy candy! This adorable little stuffed bunny was actually an Easter gift from my mom (Nana). We decided to go ahead and stick it in her basket for her since she doesn't know the difference yet. Lucy loves stuffed animals so I know she will love toting this little guy around! I try to use necessities as gifts whenever possible. It saves a lot of money to kill two birds with one stone! Lucy was in need of a new sun hat for this summer so I figured it would make a great Easter gift, too! These are one of our favorite chocolate bunnies and they're one of the cheapest! Win! I also love the smaller size...I definitely don't need my one year old eating a giant chocolate bunny! Lucy really loves these squeeze pouches of fruit! I like to get the fruit and veggie kind since she's not a huge vegetable fan. These were 89c at Target and make a great, non-candy treat! This year, I chose to skip the extra candy and use cheerios and Nilla wafers as egg fillers! Lucy loves them both and they make a super cheap filler! Next year, I think I'll make these goldfish "carrots"! What do you get your kiddos for Easter? I'm so excited to enjoy the holiday with Lucy now that she's a little older!